In the resurgent Serious Classics series, Echo Beach is proud to release In Spiritus Dub, a one-of-a-kind dub creation. The name Almamegretta has its roots in an ancient dialect that represents the transition of Latin to modern colloquial Italian speech; It means "Anima migrante", which can be translated to "migrant soul" or "wandering soul". The band was founded in 1991 by Gennaro "Gennarot" Tesone, Raiz and Gianni in Neapel; one year later, Paolo Polcari and Tonino joined them. In 1993, Stefano "D.RaD" Facchielli encountered Almamegretta during the production stage of their first studio album, and contributed his skills as soundman and dub-maker. The album produced by Ben Young was awarded the "Targa Tenco" as best debut album in 1994, and the song "Sole" was declared the track in greatest demand by 105 Network. Thanks to Ben Young, they entered a collaboration with the band Massive Attack in 1995, who offered Almamegretta a remix of their track "Karmacoma", a project that resulted in the Karmacoma EP, "The Napoli Trip". Another cooperation of Ben Young and the British Dance Formation "leftfield" lead to the production of the album Rhythm And Stealth (1999). Further international collaborations arose with artists such as Pino Daniele, Bill Laswell, Count Dubulah of Trans Global Underground, Lee "Scratch" Perry, Horace Andy, Gaudi, Dennis Bovell, and others. As remixer and producer, Paolo Baldini participated in many of these projects, earning his outstanding international reputation as dub master over and over again. Featured on In Spiritus Dub: Paolo Baldini, Horace Andy, Gaudi Rootikal, Lee "Scratch" Perry, Carlo D'Angio, and Dennis Bovell. One of the most accomplished and celebrated bands in the field of contemporary, unclassified pop music, Almamegretta are masters in combining a wide range of elements such as dub, funk, reggae, world and electronica, all filtered through their own deep southern Italian roots. The band from Naples is now back with Ennenne, mixed by the dub master Adrian Sherwood. Sherwood was involved in the band's mid-nineties masterpiece Sanacore (1995). This new work consists of ten tracks, nine originals plus a well-chosen cover of an old Neapolitan hit by Nino d'Angelo transformed into a lovers rock style song. Almamegretta's original line up of Gennaro T Tesone, Paolo Polcari and Raiz is augmented by a great list of collaborators and the result is a strong and multi-layered set made of Afro-funk numbers, reggae ballads, and other riddims, while the British dub influence remains central. The title Ennenne, which means "No Name", is inspired by the acronym used for those who are born from unknown parents. The right title for such a highly dense picture based on the combination of contemporary sounds and social topics. Features Cristina Donadio, Lucariello and Carlo D'angiò. File next to: Massive Attack, On-U Sound, Dub Syndicate, Tricky. LP version. Includes 7". 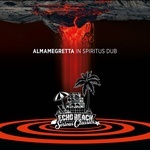 One of the most accomplished and celebrated bands in the field of contemporary, unclassified pop music, Almamegretta are masters in combining a wide range of elements such as dub, funk, reggae, world and electronica, all filtered through their own deep southern Italian roots. The band from Naples is now back with Ennenne, mixed by the dub master Adrian Sherwood. Sherwood was involved in the band's mid-nineties masterpiece Sanacore (1995). This new work consists of ten tracks, nine originals plus a well-chosen cover of an old Neapolitan hit by Nino d'Angelo transformed into a lovers rock style song. Almamegretta's original line up of Gennaro T Tesone, Paolo Polcari and Raiz is augmented by a great list of collaborators and the result is a strong and multi-layered set made of Afro-funk numbers, reggae ballads, and other riddims, while the British dub influence remains central. The title Ennenne, which means "No Name", is inspired by the acronym used for those who are born from unknown parents. The right title for such a highly dense picture based on the combination of contemporary sounds and social topics. Features Cristina Donadio, Lucariello and Carlo D'angiò. File next to: Massive Attack, On-U Sound, Dub Syndicate, Tricky.